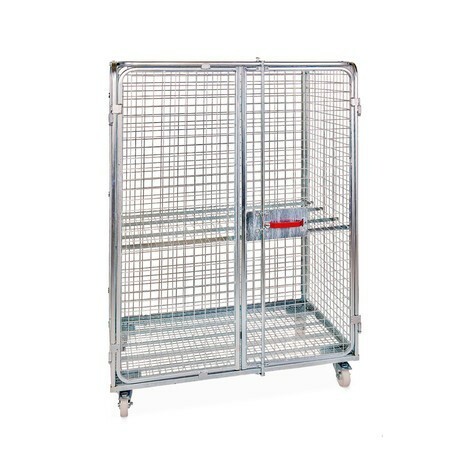 The enclosed steel anti-theft roll container provides protection for goods and valuables. With its steel frame, a non-bolted but riveted rear wall and the galvanised mesh panels, the roll container offers long-term stability. The integrated mechanism for a padlock ensures that the contents of the container are reliably secured. Thanks to the closely meshed panels of the mobile container, it is not possible to remove goods when the door is locked. 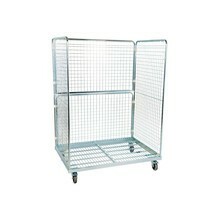 The supplied shelf can be flexibly suspended at the desired height. This gives you plenty of storage space on 2 levels. In addition, the roll container with 4 steering castors, including 2 with wheel stops, is made of polypropylene. 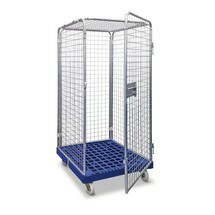 Order the steel anti-theft roll container for the safe storage of goods from our shop.